I know this is a fantasy football blog, but you can’t play the pretend game without its football core. And the sport– through the media and other outlets – has this bizarre debate being talked about to near exhaustion: Just who is the NFL’s best offensive rookie? The debate differs completely when analyzed from a fantasy football mindset. Given that running backs are inherently more vital to fantasy football success (this shouldn’t be argued, even if you’re an early-round quarterbacker), players like Alfred Morris and Doug Martin are likely more valuable than Andrew Luck, Russell Wilson or Robert Griffin III. You can make a case for RGIII given his rushing numbers, but in the end, those two backs are performing at too high a level at the most important position in fake football. As we all know, fantasy football isn’t real football (hence the word “fantasy”). Ben Roethlisberger, for instance, is considered a top quarterback in the NFL, but he’s rarely been favorable in the fantasy landscape. The fake sport is stat driven, whereas actual, on-the-field play is all about particular skill sets in a given scheme. And that’s where the debate begins regarding the NFL’s 2012 Offensive Rookie of the Year award. How far into player statistics do we (as if we were the ones selecting the winner) look in order to choose a winner? Does individual team success matter? How do we judge “best” when there are so many moving parts to the ever-changing NFL? To many, the 2012 award comes down to the players I noted above: Doug Martin, Alfred Morris, Andrew Luck, Russell Wilson and Robert Griffin III. Because of the tendency for quarterbacks to win these types of awards, I’ve chosen not to break down Morris and Martin. While they’ve had phenomenal years, there’s little chance they’ll end up winning. Adrian Peterson was the last running back to get the award, and not only did he rush for over 1,300 yards in his first year, but the rookie quarterback competition that year, 2007, included JaMarcus Russel, Brady Quinn, Kevin Kolb, John Beck, and Trent Edwards. Yuck. 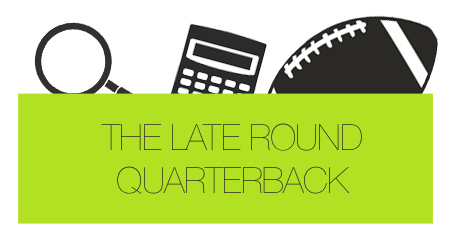 Let’s face it – the award is going to go to a quarterback. Signal callers have won five of the last eight years, and the ones who have won have not come close to how this class is performing. Either one of the two NFC quarterbacks, or the lone number one pick in the AFC will win the award. And because of the markets they play in, the perception surrounding them and their honest overall ability, the battle is going to come down to the top two picks from last year’s NFL draft: Andrew Luck and Robert Griffin III. Isn’t it unbelievably clear, though, as to who the winner is? Shouldn’t it be unbelievably clear? Why is this even a debate? Robert Griffin III should, without a doubt, win the Offensive Rookie of the Year award. And it’s not nearly as close as the media is making it. I hate to break it to Colts’ fans, but the award is much more statistic-driven than eye test-driven. Let’s just use last year as an example. Cam Newton received 47 of 50 votes for the award, while Andy Dalton got just 3 of them. Cam Newton’s team went 6-10. Andy Dalton’s team went 9-7 and made the playoffs after finishing 4-12 the previous season. In the case of 2011, Cam Newton won because his numbers clearly outweighed his team’s overall success. Matt Ryan won the award in 2008 because he led his team to an 11-5 playoff berth. His numbers in 2008 were actually quite comparable to Dalton’s from 2011. Both players took a team, after being 4-12 the previous season, to the playoffs. Dalton finished with more touchdowns (20 versus 16), while Ryan finished with about 40 more passing yards and a slight edge in the completion percentage category. Dalton threw 13 picks, while Ryan threw 11. The stats were very similar. I’m sure if Cam Newton played in 2008, he would’ve won that year, too. It’s because human beings are voting, and human beings love seeing a spectacle. The problem is, Robert Griffin III isn’t just a beautiful Christmas display; he’s a human highlight-reel who can also win with his arm. RGIII, this season, has nearly done what Cam Newton did last year on the ground, but with top passing efficiency. He’s putting up Michael Vick-like rushing numbers while throwing the ball just as effectively as anyone in the entire league. Now, given that I’m stating RGIII is a better rookie quarterback than Cam ever was, I have to say the same about Luck to Dalton. That’s why using 2011 as a comparison isn’t necessarily the best idea. The best way to view the two, in my eyes, is to see where people knock them, and figure out if the other has overcome similar hurdles. The only way we can figure out who is “better” is by finding differentiations, and then figuring out which of these differentiations matter most. For instance, one of the main arguments in favor of Andrew Luck is team expectation-based. The Colts were 2-14 last season, and already have quadrupled that total in 2012. People will look at the X factor as Luck, and for good reason. Not only is he the quarterback, but he’s played exceptionally well, especially under pressure. But all things considered, we all know the Colts have had huge changes in personnel, including their coaching staff. It’s not all Luck. And while we make this exception for Luck, couldn’t we do the same for RGIII? It’s not as though the Redskins went 13-3 last season en route to an NFC Championship loss. They were 5-11, and they had no answer at the quarterback position (unless you thought Rex Grossman is the answer). There’s also this idea that Andrew Luck has worse personnel on the offensive side of the ball when compared to RGIII’s situation in Washington. I mean, I understand that he’s playing with young guys. I get that nearly every skill position on offense has a rookie associated with it. But, really, what does RGIII have? Josh Morgan? Pierre Garcon for a few games? Fred Davis’ torn Achilles? The clearly finished Santana Moss? At least Andrew Luck has a potential future Hall-of-Fame receiver lining up with him on every play. The response I’ve typically received when I say there’s no substance to the personnel argument is, “Yeah, but the Redskins have a running game and the Colts don’t!” These Luck supporters fail to realize that the Colts running game isn’t nearly as bad as most make it out to be, and that it actually creates more opportunity for Andrew Luck from a numbers-perspective. Seriously, do you, right now, know where the Colts’ rush offense ranks in the NFL? 19th. Is that good? No, but it’s not completely horrible, either. Realistically, Andrew Luck is getting his numbers because of quantity. That’s a nice segue into the statistics discussion. The numbers surrounding these two rookie quarterbacks are clearly – and I mean clearly – in favor of RGIII. While Andrew Luck has nearly 1,000 yards more through the air than RGIII, we need to realize that he’s also thrown the ball 178 more times. Griffin’s yards per attempt is actually higher than Luck’s. And even with the higher quantity of pass attempts, RGIII still has the same number of touchdowns as Luck with 17. The most impressive and lop-sided statistic is in the turnover category. Andrew Luck has thrown 16 interceptions to RGIII’s 4. You want to blame that on the size of pass attempts for Luck? You probably shouldn’t. Andrew Luck is throwing an interception every 31.43 pass attempts (3.2%), while RGIII is throwing one every 81.25 passes (1.2%). To put this into perspective, RGIII’s pass attempt to interception ratio is better than Aaron Rodgers, Peyton Manning and Drew Brees. Not to mention, RGIII has more rushing yards than plenty of starting NFL running backs. Ranking 21st in the league, Griffin has more yards on the ground than Michael Turner, Mikel Leshoure and Ryan Mathews. And the Skins’ quarterback is tied for 10th in the league in rushing scores. Want more? RGIII’s completion percentage is tied for fifth best in the entire NFL. Andrew Luck’s is only better than John Skelton and Mark Sanchez. And for what it’s worth, RGIII’s quarterback rating is nearly 30 points better than Luck’s. The one thing – aside from overall team record – in Luck’s favor is the clutch factor. Scott Kacsmar wrote a great piece comparing the big three rookie quarterbacks on Bleacher Report, and it shows that Andrew Luck is clearly the most clutch quarterback of all rookie players who line up behind center. The problem, as I noted above, is that this isn’t the way people vote for Rookie of the Year. And, to me, it’s still not nearly enough to make up for what Luck lacks statistically. With four more weeks to decide the debate – we’ll see.